It seems that all the voice assistants, which are becoming standards for smartphones, do not like to lie. First it was Apple’s Siri which went to agree that Windows Phone running Nokia Lumia 900 was the best smartphone. 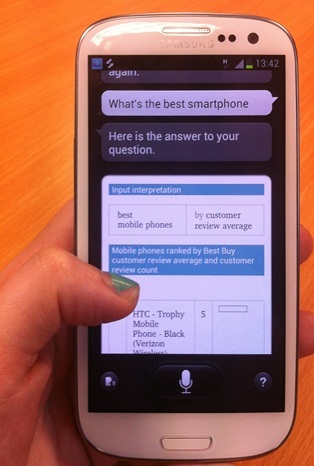 And now it is Samsung’s S Voice which believes that another Windows Phone running HTC Trophy is the best smartphone. Yes, Samsung’s S-Voice has declared that Windows Phone running HTC’s Trophy is the Best Smartphone based on the Best Customer ratings on Best Buy’s website. This may bring in some joy to Microsoft but then it might not be long before Samsung goes Apple’s way and tweaks S-Voice to return the answer in the Korean giants’ favour. But one thing is for sure, based on customer ratings, people are surely loving Windows Phone devices and rating them fairly well over iPhone and any other Android running smartphone. At the end of the day, it is Microsoft who has won. What do you feel? Windows Phone is the best?